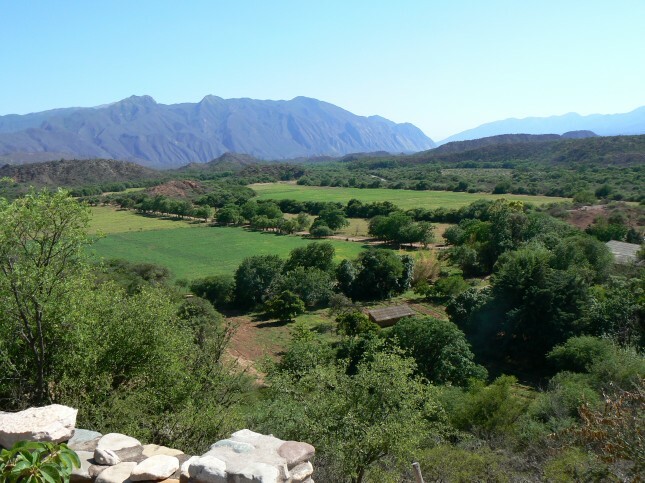 When I told winemaker Duncan Meyer that I would be working a harvest in Patagonia, he recommended I make my way up to Salta’s Condor Valley and kindly put me in touch with owner, Hank Bannister. Hank and I grabbed a glass of wine at San Francisco’s Terroir to discuss the details of my trip back in February. I left the meeting with a better idea of what to expect but as it turned out, I had no idea what I was in for. CV was the first side trip I planned before I headed down to South America and the last place I ended up visiting before returning to the States. Travel-wise, this was the way it panned out and in retrospect I wouldn’t have planned it any differently. It was the perfect end to my time in South America and undoubtedly one of the best adventures I have had to date. I arrived in Salta with my friend Joanna via a twenty-two hour bus excursion from BA that was supposed to take eighteen- a less than ideal mode of transportation but as broke backpackers, we made do. Despite our tardiness, Martin met us at the bus terminal as promised. 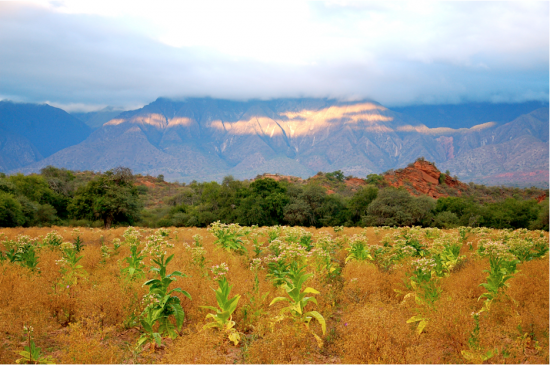 Already four hours behind schedule, he insisted on giving us a quick tour of Salta before heading out of town. 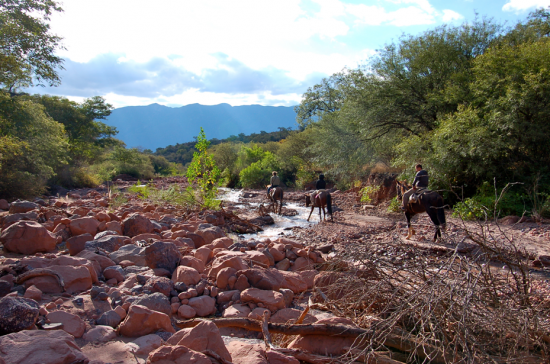 Aptly recognized as the fifth most beautiful city in South America, Salta is charmed by pristine Colonial architecture, rich history and amiable weather. 80% of the province’s inhabitants are natives resulting in a powerful cultural identity, opposite from the cosmopolitan Buenos Aires where I had just spent nearly two weeks. Don’t misunderstand, I enjoyed the metropolitan capital but am so grateful that my last few days were spent in such an innate habitat. It was here that I began to grasp how diverse Argentina is, abound with native cultures, various dialects and contrasting landscapes. After the brief tour we drove an hour south to Chicoana where we stopped by Martin’s home, a former Inn on the main square where he and his family reside on the weekends. We picked up his wife Silvana and daughter Mora and loaded up the truck with all the necessary goods we needed for the next four days, a weekly routine for the Pekareks. It wasn’t until then that I began to conceptualize just how remote La Bodega actually is. We took off into the night and continued heading south to Condor Valley. Despite the pitch black backdrop, Martin described our surroundings in detail and reassured us that we would be able to see everything on our return drive. We turned off the paved road when we reached the Valley entrance and although we couldn’t see much, the night sky provided just enough luminosity for us to make out the enormous Mt. Creston that welcomed us onto the property. Jo and I looked at each other in disbelief as we suddenly recognized the scope of what was in store. We were greeted at the house by Martin’s two sons, Bruno and Dario, and had a glass of wine in our hands within minutes. Silvana prepared a delicious meal of tamales and fresh avocado salad. After two hours of eating, drinking and chatting Jo and I retired to our candle-lit room, opened the big glass windows and fell asleep to the cool mountain breeze. We woke up when the morning light began to spill into the room, revealing a breathtakingly colorful sunrise and after fading in and out of sleep for a couple hours, finally started the day at 9am. We had a light breakfast of toast and freshly brewed coffee before heading down to the farm. It was round-up season- a two month process whereby the cows are corralled, vaccinated and assessed for sale by traditional gauchos. While two months might seem generous, it is actually a modest time frame considering there are 420 cows that roam freely on the 64,000 acre property. The work of a gaucho is brutal; not only is it time consuming, it can be scary. 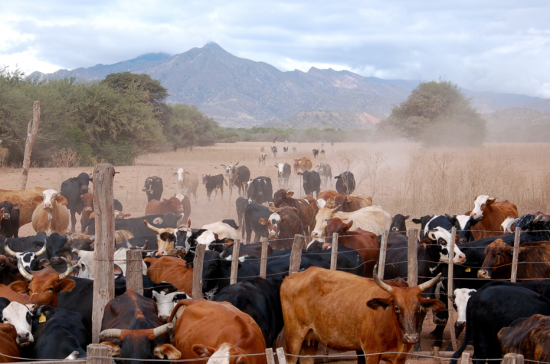 Finding the cattle is a feat in and of itself but herding the wild livestock for miles at a time is a dangerous undertaking. Wanting to experience every facet of farm life, Jo and I didn’t think twice about helping the boys with their daily work. 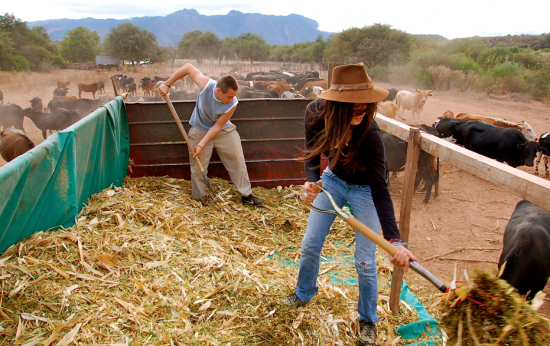 We jumped in the fodder-filled trailer and within minutes were pitchforking breakfast into the cow corral. One hour and 100+ happy ruminants later, we headed back up to the house for some Milanese, one of my favorite Argentine dishes, and I picked Martin’s brain on the history of Argentina. We discussed the infiltration of the Incan Empire, the triumph of the Conquistadors and current-day government policies. 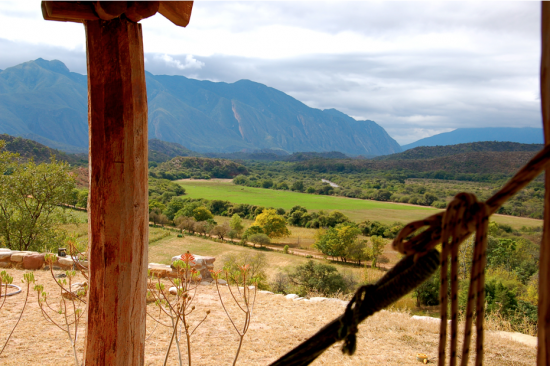 He explained the cultural evolution noting that there are eight distinct communities in Salta alone, each of which speak a different indigenous language. Having a background in anthropology and tourism, Martin is a wealth of information and has a knack for storytelling. I could have talked to him for hours but following lunch came the afternoon workload. We headed into the corn fields because even though the harvest was over, the work was not. We scoured the fields for the stalks’ remaining husks and selected the best ears for seed that would be used to plant next year’s crop. Joanna, Dario and I worked for nearly two hours when Bruno rolled up on a chopper and began cutting down the crops that had already been through this selection process. 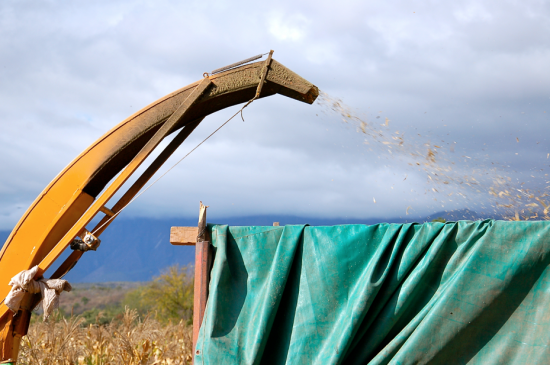 This machine levels the crops for the following harvest and the chopped corn remnants, known as silage, becomes animal feed for cud-chewing livestock. Farming 101: it all comes full circle. We piled our burlap bags of corn onto the tractor and headed back up to the house where we prepared for our evening fishing excursion. The four of us took off and arrived at the lake at dusk. Joanna and Dario caught bait while Bruno and I made a fire. 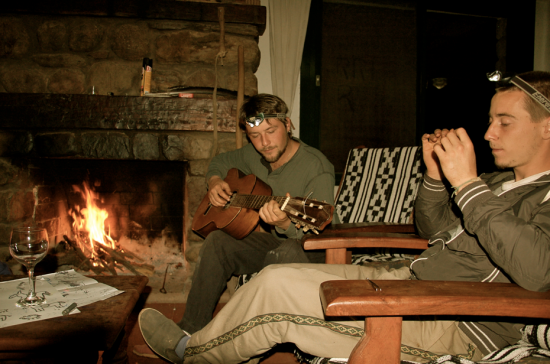 We paid our respects to Pachamama, the Incan mythology equivalent of Mother Earth, drank cold beer next to the hot fire and got our fish on. Three hours and six liters of beer later we decided to keep the party going. I was on vacation, after all. We made a quick pit stop at the local river rafting company, picked up six more bottles and headed to the creek where we made another fire, played jacks with stones and told stories until wee hours of the morning. 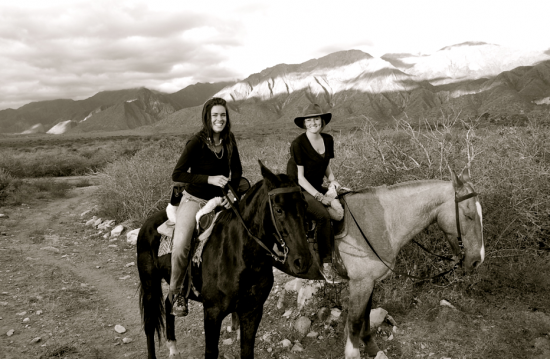 We awoke the next morning and embarked on a seven hour horseback ride. I’m not sure what I was expecting but given the rusticity of La Bodega I should have known we were in for an adventure. Let’s just say it was not a trail for beginners. However, having ridden a horse only a handful of times in my life, I was thrilled by the perilous outing. Martin is a pro when it comes to taking risks but certainly encourages everyone to stick within their comfort zone. Luckily our group was an open-minded and athletic bunch that welcomed such uncertainty. The first hour of the ride was mellow, walking with the occasional trot, and it wasn’t until we reached a thicket of dried brush that complication ensued. Certain parts of the trail were completely overgrown with scrappy bushes, making it difficult to navigate. Bruno’s machete remedied most of these obstacles but at times we dismounted and crawled through the underbrush. This might not appeal to some but I had fun being off the beaten path, even if I did get a little scratched up. angered. Reaching up to ten feet in wingspan, Andean Condors are the second largest flying birds on the planet. They are monogamous, laying one egg annually, and can live over fifty years! 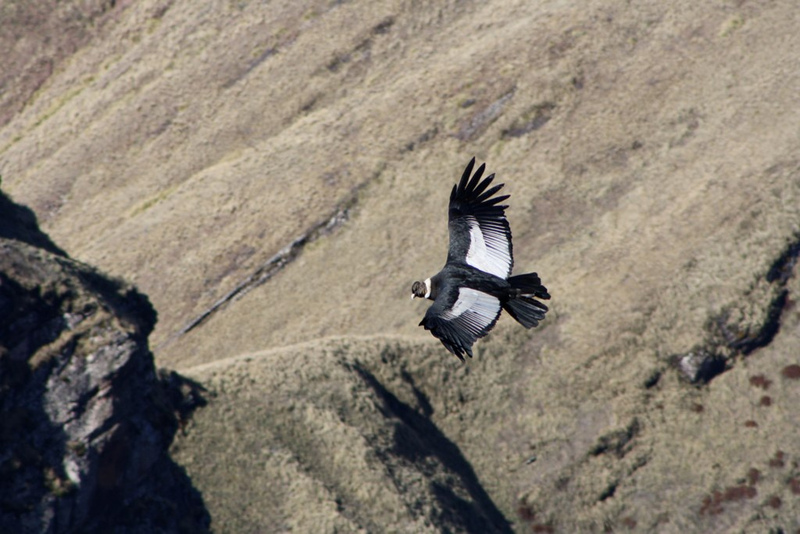 The fact that they are protected here in Condor Valley is commendable, as these birds are truly fascinating. We eventually made our way back to La Bodega, eager to enjoy a sheep asado. 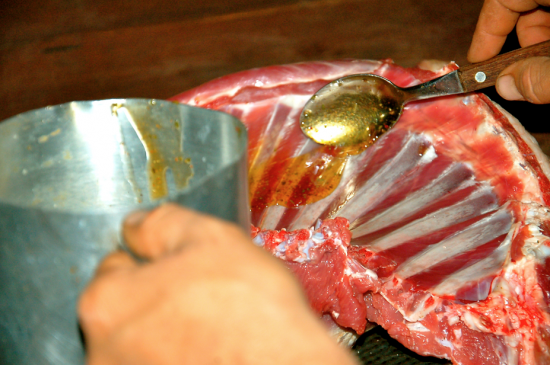 The group sat around the large barbeque drinking local wines of Cafayate while Bruno manned the grill with precision. Asados are a fundamental part of Argentine culture and are one of the things I have found I miss most since returning to the States. The meal was honestly one of the most delicious dinners of my travels in addition to being one of the most memorable. We wound down the night in front of the fireplace, rehashing the adventurous day, drinking more wine and listening to Martin wail on the guitar. It was the perfect end to our trip. I spent the next morning hanging on the front lawn while Jo and the boys went to feed the cattle. I was returning to the States three days later and wanted to relax and reflect on the four months I had spent in South America that was sadly coming to an end.Of my time there I can genuinely say that the time I spent in Condor Valley was one of the best experiences of my entire trip, hands down. Words simply cannot capture the Valley’s immensity, the landscape’s raw beauty and the authenticity of the Pekarek family. They went above and beyond to show us the best time possible and they succeeded; of my South American travels, this is the one place I will certainly return. Thank you so much for everything- Hank, Martin, Slivana, Bruno and Dario. Words cannot express my gratitude.